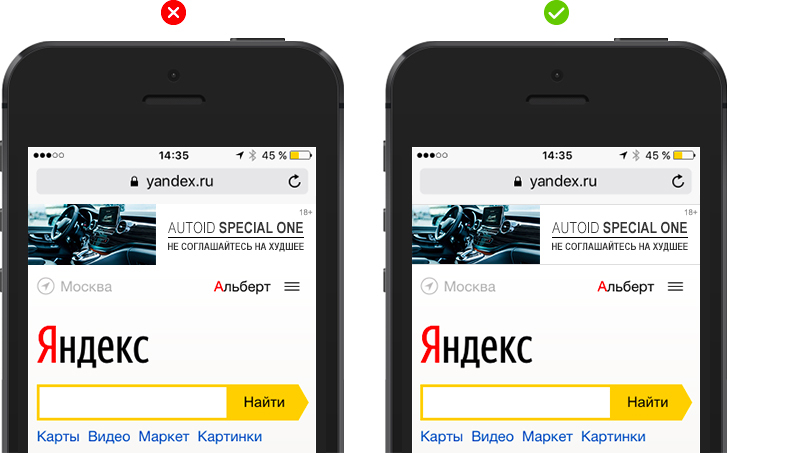 Don't forget to read the common technical requirements for the banner ads and technical requirements for the banner on the mobile version of the Yandex main page. The descriptions show reduced-size images. Download this archive to view the full-size examples. 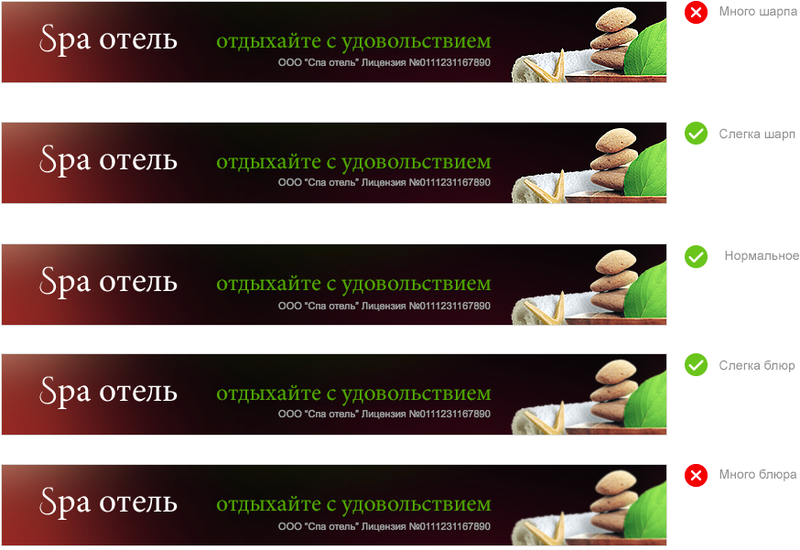 For a single line of text, the banner font must not be higher or wider than the capital letter “Ф” in the “Arial Bold” 36 pt font (that is, the height and width of a square with 26 px sides). For a two-line text, the font can be up to 25 pt (a square with 20 px sides). For a three-line text, the font can be up to 20 pt (a square with 15 px sides). The minimum font size is 11 pt (in logos, messages, illustrations, and disclaimers). An exception is photos of packages and products, as well as screenshots. The indent from the edge of the banner to the text must be at least 10 px. This requirement doesn't apply to placement of the age restriction. A logo or a brand, product or technology mark can take up to 10% of the banner area. Complex multicolor backgrounds (with small elements over the entire area) or a background close to the font in color. Text should contrast with the background and be easy to read. Yellow background for the banner, as this color is used in standard elements of Yandex page designs. Acceptable yellow is #f0e5ad and lighter. A frame can be used only along the horizontal borders of the banner. If there are white elements that cross the banner border, or the background color is white, you need to add a contrasting 1 px horizontal frame (at the top and at the bottom). The most suitable frame color is #dadada. Banners and banner elements should not flash because this distracts the user from the webpage contents. Obligatory legal information (for example, the bank name in the list of legal entities, terms of a promotional offer, and so on) must be clearly visible immediately, before the user interacts with the banner. For details, see additional recommendations. A banner can't be disguised as a user interface element, such as a Windows system window. A banner can't contain standard user interface elements (a cursor, search field, buttons or other elements) that don't perform the corresponding function. 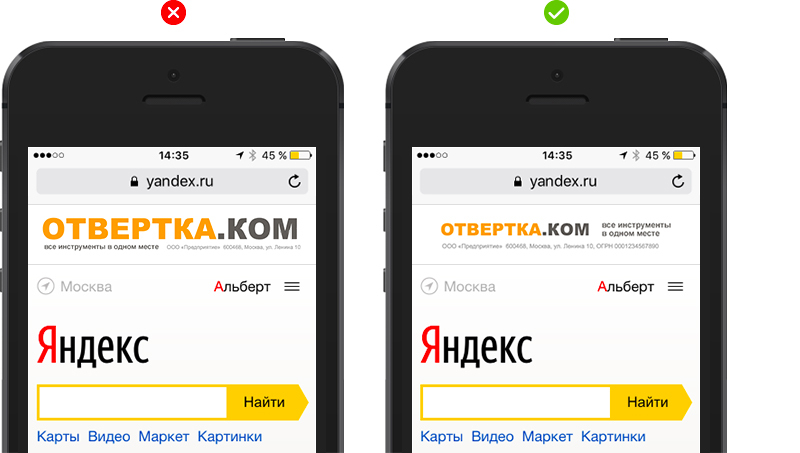 Don't use yellow in the interface elements, since this color is used in standard design elements on Yandex pages. The acceptable yellow is #f0e5ad and lighter. Place the age restriction mark at the top right corner of the banner. The font is “Arial regular” 12 pt. If the grey mark isn't readable, for example, against a multicolor background (with small elements over the entire area), it must be placed on a white base layer. You shouldn't use yellow color for the button, since this color is used in standard design elements of Yandex pages. The acceptable yellow is #f0e5ad and lighter. Unreadable font is the cause of 90% of rejections during banner moderation. Try to avoid fractional coordinates when aligning the font in HTML5, as they can “blur” the text (you need to check this in all popular browsers). We recommend using vector fonts. If vector fonts can't be used, save bitmap text blocks in the best possible quality (within the banner size restrictions). In some cases, the font in vector format also causes “blurring”. Decorations of fonts and text boxes (shadows, outlines, and 3D effects) can make the message less readable. Use a maximum of two fonts or font styles. Use a maximum of three colors in fonts. The brand, product or technology logo. The disclaimer or mandatory legal information. The age restriction mark font. A font that is part of an illustration. Don't try to fit a lot of information in a narrow banner. Create a short and simple text so that the message can be grasped instantly. Don't use small images with a lot of small details. Don't use photos with a lot of small details for the banner background. Text should contrast with the background and be easy to read. The minimum font size is 11 pt. Obligatory information (for example, the bank name in the list of legal entities, terms of a promotional offer, and so on) must be visible without the user interacting with the banner. Dates of the promotional offer are shown in the first frames. Other information (obligatory for the customer) must be accessed from the “legal information” box when the user points the mouse at it . The frame with obligatory information must be shown for at least three seconds. The frame with obligatory information (the bank names in the list of legal entities) must be shown for at least three seconds. The user should be able to click on pause and read the rest of the information. If the user doesn't click on pause, the banner animation continues. The legal information is displayed for at least three seconds, and is also available afterwards when the cursor hovers over it.